The emotive whimsy was as thick as the smoke bellowing out from behind the wooden tree sculptures that framed the stage as Kaoru Ishibashi (aka Kishi Bashi), dressed in a dark button-up shirt with a bow tie and suspenders, appeared in front of a sold-out Biltmore crowd. Flanked by space banjo player Mike Savino (Tall Tall Trees), who would alternately pick his glowing instrument and hit it with a soft mallet while working a slab of effects, and Elizabeth Ziman (Elizabeth & the Catapult), playing floor tom, keys, and a couple other bits, this set was magic from the moment go. 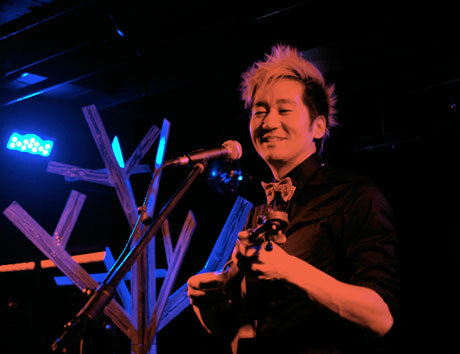 Starting off with a couple numbers from Kishi Bashi's debut album 151a, Ishibashi's well-worn violin and delicate falsetto were soaring majestically by the time they hit "Evalyn, Summer Has Arrived" from his Room for Dream EP, fostering the feeling of a state-of-grace vacuum. Savino and Ziman were perfect additions to the beat-boxed, pitch-shifted looping Kishi Bashi live show. Not only did they suit the aura of his joyful noise aesthetic, adding their own sparks and giving Ishibashi different timbres to harmonize with other than himself, they were capable enough to allow him to perform "Chester's Burst over the Hamptons" live, which never happened before this tour. Yet one of the most striking moments came when Ishibashi sent his touring band away so he could perform his "I Am the Antichrist to You" ballad. Despite the level of social lubrication among the Saturday night crowd, one could hear a pin drop as he organized his wall of dulcet tones to the point of dropping everything but the mic to just sing, bringing the love song to a lush heartbreaking crescendo. They ended up playing most of 151a this evening, as one would expect. Ishibashi hasn't released a lot of material so far, so most of his recorded works were employed to fill the hour and a quarter, yet his set never felt limited. However familiar the crowd was with his work — and their vigourous singalongs suggested they knew it well — it always felt as if an expansive experience, an infinity in sound as Esquivel might say. With the live set-up, "Beat the Bright Out of Me" and "Bright Whites" exuded a refreshing hootenanny quality, while "It All Began with a Burst" exploded well beyond its comparatively tame recorded version. Everything was bigger and brighter. With Ishibashi returning to perform the encore alone, the elegant sound of "Manchester" capped the set perfectly. His lyrics, his style, his demeanour — Kishi Bashi is brilliant. He taps into something nice but genuine, emotional but not sappy, and as his catalogue grows, so will the size of stage he performs on.